The St. Mary’s team that brought together Rosar’s family with the people of Orsan, France, are (from left to right) Meagan Alsaati, Professor Teresa Van Hoy, Celina Jacobson, Tala Alsaati, Danielle Garza, Mariana Sandoval, Michelle Champion and Jessica Moore. He was their champion, yet they never saw him alive. They never saw his face. They knew only his name. For 71 years, French citizens in the small village of Orsan have been celebrating the memory of an American fighter pilot who died in a crash there during World War II. They waited for a chance to give a section of his blood-stained, green silk parachute to his family. Across an ocean, that family slowly learned details of that night in 1944, but they had no idea their beloved son, brother and uncle was a symbol of French liberation and patriotism. It took a group of undergraduate History students in Texas to bring them together. Teresa Van Hoy, Ph.D., Associate Professor of History at St. Mary’s University, heard the story of the American pilot and the French villagers from French colleague Gérard Mignard, D. Lit., who lived in a town neighboring Orsan. A former professor and current councilman of his village, he knew Van Hoy’s curiosity and historical expertise would be invaluable to Orsan historian Michel Benoit, who wanted to find the pilot’s family and return the parachute fragment. So Van Hoy and her nine Public History students took the case. In about three months, a decades-old mystery was solved. In early summer 1944, France was under German occupation as Allied air attacks prepared to liberate southern France. On June 15, 2nd Lt. Joseph Rosar and two fellow F-51 Mustang pilots were on a mission to destroy a supply train, but there had been no reconnaissance — they were flying blind in hostile territory. As they flew low over the Rhone, Rosar’s plane hit a high-tension cable, which sheared off a wing. He was ejected as his plane flipped, landing upside-down on a house. The stunned villagers found Rosar’s body and wrapped it in his parachute before the Nazis took it for burial. 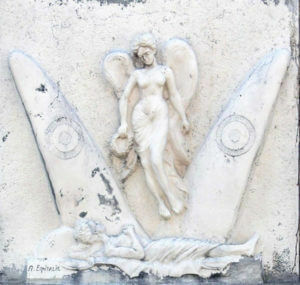 the house where Rosar crashed and a monument of an angel in the town square. Adolph and Honor Rosar and their two sons, Joseph and Edgar, lived in a working-class Irish community near Scranton, Pennsylvania. When America entered World War II, Joseph learned to fly planes. 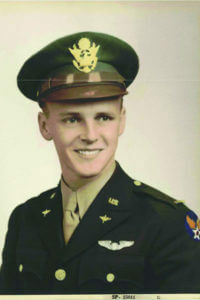 After the crash, the Rosars thought Joseph was missing in action after being shot down. They held out hope until April 1947, when they received a telegram telling them to claim his remains from an American cemetery in Belgium. In 1949, Adolph brought his son home. Honor became ill after learning her son was dead. She never fully recovered and died five years later. Van Hoy had never done genealogical research before, but one of her students, Celina Jacobson, had been researching her family history since 2009. The junior History major from Burleson searched Ancestry.com with only scant details — Joseph’s name, death date, father’s name and military ID — from the French historian. The first hit was a military headstone application, which revealed his birth date, which helped unlock military records, census records and death certificates. Each new detail opened doors, and she was able to find names of Joseph’s ancestors as well as his brother’s daughters, who were still living. Freshman History major Danielle Garza, a San Antonian whose father is third-generation Air Force, created a micro-documentary of the project. 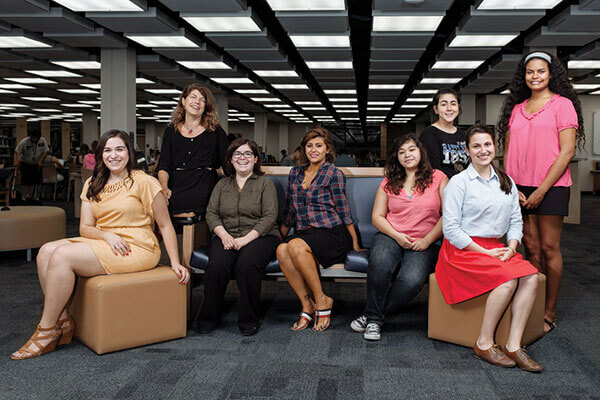 Mariana Sandoval, Tala Alsaati, Michelle Champion, Jessica Moore, Meagan Lozano, Tiara Bouldin and Jose Andrade also helped fill in the gaps for the French historian, who for years had been stymied by barriers of language and distance. The French village of Orsan has a monument in the town square honoring 2nd Lt. Joseph Rosar. The statue features an angel standing over the wreckage of Rosar’s plane. Edgar Rosar had told his daughters — Honor, Kateri, Daria and Sharon — about “Uncle Joseph,” but they didn’t get an accurate picture of his final days until Honor, a Navy veteran, obtained his military files. One day in 2013, they found an Internet photo of Orsan’s shrine, but didn’t know what to do. “We said, ‘We need to make a trip over there, but where do we start? Where do we go?” Honor said. Then one day the phone rang. The class had tracked them down using a modern research method: social media. The students found the sisters on Facebook, and Van Hoy broke the ice with a call to Kateri, whose number she found on LinkedIn. “You can imagine how weird that was: ‘Well, I’m a history professor in Texas trying to help a French village find the descendants of your uncle, Joseph Rosar.’ She let me go on, and by the end she was really moved: one, that the French village cared, and two, that the kids cared,” Van Hoy said. Three of the sisters — two live in Virginia and the other two in Florida — were able to “meet” Van Hoy and her class through Skype. They were astonished to learn the depth of Orsan’s admiration for Joseph. The sisters provided Army documents and family mementos to help complete the project. Perhaps the most important contribution was a simple photograph. The villagers didn’t know what Joseph looked like, but Van Hoy planned to rectify that. During a scheduled trip to Spain in March, Van Hoy took a detour to Orsan, where Michel Benoit and the villagers were waiting eagerly. She brought Joseph’s photo, the micro-documentary, St. Mary’s souvenirs and a photo of the students with President Thomas Mengler and Dean Janet Dizinno, Ph.D.
About 40 people attended a town hall ceremony, including the mayor and several elderly villagers who had witnessed the crash. Even the woman whose house was hit by the plane was there. When the formal presentations had ended, the elderly began reminiscing about that fateful day — quietly at first, then confidently. This is not the end of the story, Mignard said. Orsan will have another ceremony this summer. The four sisters will visit next spring and finally receive the parachute. Joseph Rosar won’t soon be forgotten.